Elizabeth Started All the TROUBLE... That's Elizabeth Cady Stanton, of course. Author, Doreen Rappaport, and illustrator, Matt Faulkner, have teamed up to create a comprehensive look at the history of the women's right movement in the U.S.. There have been several picture books biographies published about specific women who fought for women's rights including Elizabeth Cady Stanton, Susan B. Anthony and Amelia Bloomer. What makes this book unique is that it is a look at the history of the suffrage movement and the many women who fought for the right to vote. The book begins with Abigail Adams advocating for women to have equal rights and ends with the passage of the 19th Amendment in 1920. Along the way, young readers will learn about the work of Elizabeth Cady Stanton, Lucretia Mott, and Sojourner Truth at Seneca Falls. Rappaport writes in an engaging narrative style that fits well with Faulkner's illustrations. Faulkner captures the personalities of the subjects. The use of speech bubbles and caricatures of historical figures help to soften the heavy topic for young readers. Information is also cleverly conveyed in newspapers and signs found in the illustrations. In just 40 pages, readers will gain a solid overview of the suffrage movement from Susan B. Anthony and suffragists of the 1800s, to women who fought in the Civil War, and Alice Paul who was jailed for picketing outside the White House. Children and adults should be sure to take time to read the back matter that includes a list of Trailblazers, important dates, and lists of books and websites on the suffragist movement. 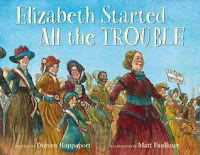 Elizabeth Started All the TROUBLE is a recommended purchase for schools and public libraries. It's a book that can be shared with large groups of children and would make an interesting read for young readers interested in our country's history especially in a voting year. Visit Doreen Rappaport's website to see pages from the book and to learn more about women's history. The reviewer received an advance copy of the book from the illustrator. Can't wait to read this one! I also loved Tanya Lee Stone's Elizabeth Leads the Way.